That is why DimDim users (or shall I say ex-users?) should be careful at choosing the right alternative for their online meetings. Those who are looking to replace their free DimDim account with another freeware will find a lot of alternatives on the market, but most will likely push advertisements for exchange. DimDim subscribers, on the other hand, can choose from a variety of established web conferencing solutions, without ads. ISL Groop proffers as the perfect alternative (read a review of ISL Groop). Is ISL Groop an alternative to DimDim? 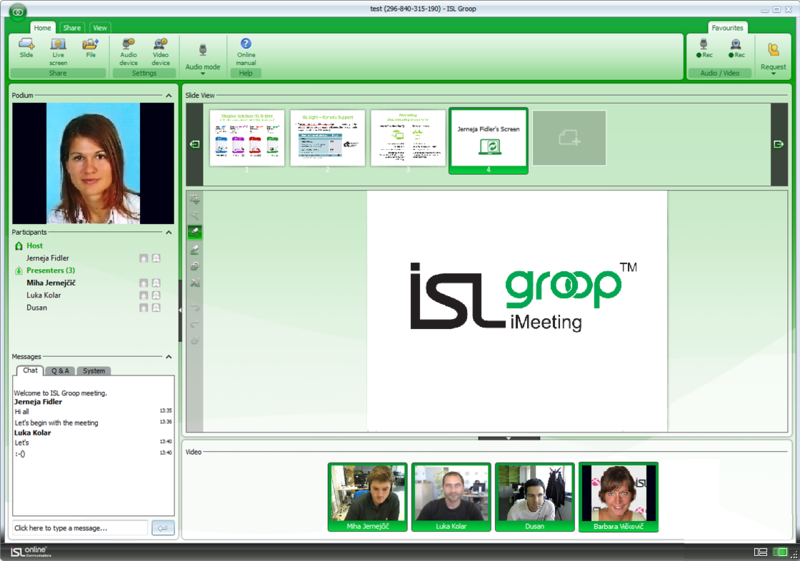 ISL Groop is a web conferencing software for online meetings, live webinars, e-learning and web collaboration. Downloading the software is quick, and there are no additional plug-ins to download such as for audio or video. It’s cloud-based (sessions running on a global network of servers) meaning ISL Groop sessions are fast and stable. It does what similar solutions do (Webex, GoToMeeting) and does it well, really well: you invite users, import slides or create them on-site, share desktop or an application, easily start audio (VoIP) and video conference, chat in public or in private, annotate, pass podium to other participants, change presentation layouts, export slides, etc. Plus it’s incredibly simple and intuitive, even those who are not so computer literate can master it in less than 10 minutes. For those of you who want to test ISL Groop immediately – join a demo session and play around a bit. Or you can test the full version free for 15 days. Another good news for DimDim subscribers: our company, ISL Online, has decided to make the transition to an alternative online meeting solution as smooth as possible and offers them a prolonged fully functional testing period until their DimDim subscription expires. So, if you are a DimDim customer, I encourage you to write an inquiry to sales@islonline.com. Good luck to all DimDim users! This entry was posted in ISL Groop, online meeting, Uncategorized, web conferencing and tagged dimdim alternatives, dimdim replacement, free web conferencing, online meeting, replace dimdim, web conferencing. Bookmark the permalink.